Party season is about to enter full swing. And an embellished mini dress is certainly one way to shine for those end-of-the-year events. From fun fringe to sparkling sequins and feathers, these dresses definitely own the room. Wear with a leather jacket for a little edge or pair with faux fur coat for the perfect glamorous moment. So get ready to be the center of attention in an embellished mini dress. Check out our eight picks below! Channel rainbow power in a striped sequined embellished mini. 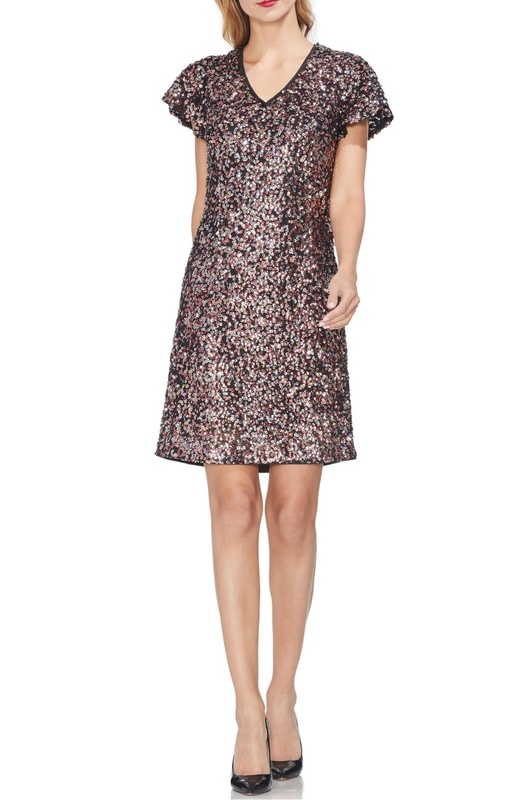 Made with multicolored sequins, this dress turns up the shine factor. The classic little black dress gets updated with faux feather trimming. Made from stretch-knit fabric, sequin embellishments upgrade this long-sleeve dress. A cowl neckline makes this rose gold dress perfect for putting your assets on display. Made with a bodycon silhouette, the Zoe dress features a bronze finish. Get ready to hit the dance floor in a fringed embellished LBD. Step out in style wearing this sparkling dress that hits just above the knee.